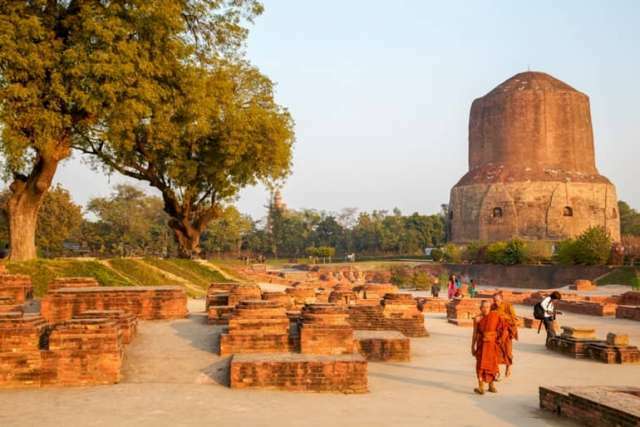 A small village situated in 10 km north-east of Kashi or Varanasi in Uttar Pradesh which is a major Buddhist shrine also known as Sarnath and the popularity of this place is from Lord Buddha. It is believed that after receiving knowledge in Lord Buddha he got his first preaching which is given the name of "Dharma Chakra Enlightenment" and which was the beginning of the propagation of Buddhist propaganda only in Sarnath and therefore This place is also a very special place for Buddhist followers. This place is one of the four major shrines of Buddhism (the other three are: Lumbini Bodhgaya and Kushinagar). Simultaneously Sarnath has gained importance in Jainism and Hinduism. In Jain texts it has been called 'Singhpur' and it is believed that the birth of eleven eleven Tirthankar Shayriasnath of Jainism took place at a distance from here. Here is the temple of Sarangnath Mahadev where there is a fair of Hindus in the month of Saawan. If you plan to move around this place This is because there is a lot to see here along with seeing. There is no interesting history related to every heritage and place. Who retains the adventures of the journey. The place where Lord Buddha gave the first historical teaching of his religion to the five monks is known by the names of Dharmak or Dhmek. From here onwards the Buddha gave the order of "Bahujan Hitiayya Bahujan Sukhaaye and Lokanukkampayay" to five classical monks. Emperor Ashoka built it in a 30 meter circle by a very special bricks and stones in a form of spherical and 43.6 meters high and a 28 meter wide stupa. The beautiful carvings of the Gupta period can be seen in this stupa made of brick and stone. Ashok had come here with his Guru Mangaliputra III 20 years after his reign of throne. According to the inscriptions of the stable Pal-Vasantpal the old name of Dhammak was Dharmachakra Stupa. Due to the first preaching Buddhist followers regard it as a Buddha and worship it and perform Parikrama. If there are visions of something before the ghats and temples in the city of Varanasi it is Chaukhandi Stupa which is said to be the most visited stupa by tourists. This place is considered to be the most sacred place in all holy pilgrimage places of Uttar Pradesh. Chaukhandi Stupa is one of the most important and important monuments of Buddhist culture people believe that it was built during the era of Emperor Ashoka and this stupa was built right here where the great Buddha met his five It was from the ascetics that the Chaukhandi Stupa of Sarnath is completely made of bricks and there is an octagonal shape tower in the middle which is very attractive to see if you find this place If you go you will also feel the divinity of the memorial in the air surrounded by here. After going to Chaukhandi Stupa tourists get a different peace which is very amazing. Mulagandha Kuti Temple which though now only remains there it will be wonderful to see it also. Its incredible architectural style has impressive designs and patterns that are very special. Which separates it from other temples as well as attractive graffiti can be seen here it was made by a renowned painter Kosetsu Nosu of Japan. There is a large bell of copper on the entrance of the Mulagandha Kuti Vihar which was gifted by a Saheb family from Japan. Apart from collection of Buddhist literature here is the statue of Lord Buddha which is worshiped. Radhagandh Kuti Vihar monastery was created in 1931 with the donation of various countries and international Buddhist communities which are also called Maha Bodhi Society which was made by Angarka Dharmapalal the founder of Mahabodhi Samaj. There are spiers on top of the huge building which make it like a church here also a gemstone statue of gold of Gautam Buddha is kept. Apart from this there is also a Bodhi tree located in this temple which was planted here by a branch of Sri Lankan tree through transplantation. This tree in Sri Lanka is originated from the same root tree under which Gautama Buddha had attained the knowledge of some 2500 years ago in Bodh Gaya. Vihar is described with the sacred relics of Shakyamuni Buddha. It is open from sunrise to sunset and entry is free. Here you can see everything related to Buddhist art. From 10 am to 5 pm you can come here anytime. Inside the Museum Dharmrajika Stupa Sadharmachar Vihar etc. are Founded in 1910 Archaeological Museum performs collection of artifacts from 3rd century BC to 12th Century AD. If you come to visit Sarnath then go to see the ancient artifacts kept in this museum. The Ashok Pillar the national symbol of India and the emperor Ashoka is a symbol of the journey of Sarnath the stone-built Ashoka pillar is an impressive structure with four lions on top. This 50-meter-long pillar is a gift of Buddhism to Ashoka by the Ashok with a dharmic stupa. In the Ashoka Pillar premises you can see many monks meditating the whole complex is full of lush lawn which attracts tourists very much. Explain that India's oldest archaeological museum is built in the periphery of this complex. The Dhammak Stupa located here is an important place for the Buddhists here Lord Buddha had first preached his lessons. A famous attraction in the Thai temple Sarnath which shows the style of architecture here. It is said that this temple is made up of beautiful gardens which is the center of attraction of tourists and pilgrims coming here where peace and peaceful are provided by Buddhist monks. The Tibetan Temple is one of the chief shrines of Sarnath this temple is decorated with Thangaas which are Tibetan Buddhist paintings. This temple has a statue of Shakyamuni Buddha. Here outside the temple building you can see prayer wheels which are rotated in the clockwise direction let us know that in this temple there are a large number of pilgrims and Buddhist scholars from Thailand Tibet China and Japan. This place situated on the banks of River Ganga in Varanasi is also known as Jain Ghat. There is a white statue here. On the other hand Digambar Panth has also kept a black idol. Here comes the feeling of peace and comfort separately. Yes if Sarnath of Varanasi is coming then take some extra money from the budget because the silk here has its own identity throughout the world. Pure and beautiful silk sarees are made of shopping. Apart from this this place is also famous for wood and clay utensils copper bronze toys. By Air route- Varanasi the nearest airport to reach Sarnath. From where you can take a taxi and go to Sarnath. By Rail route - Varanasi Cantt here is the nearest railway station that is connected to most cities. Well there is a railway station in Sarnath but there is a lot of stops for trains. By Road - Varanasi can easily reach Sarnath by availing bus and taxi on the canate. Apart from this taxis and cabs will also be found. If you want to know about the good times of going to Sarnath then tell that the time from October to March is best for Sarnath. It will be better not to go to this place from April to October because the scorching heat in this area can bother you. If you want to be involved in various festivals celebrated here then tell that the main festivals here are Buddha Purnima (May) and Maha Shivratri (February-March). If you are going to visit Sarnath's pilgrimage places and want to know about the food and the restaurant here tell you that there are not many restaurants in Sarnath even though there are few restaurants but they are also very good and delicious Get food In some areas you can also enjoy Chinese food here. Along with all this you can also taste Tibbuti dishes such as mamose tastes here.